This is a history of the descendants and some of the descendants' relatives, of Patrick Morrissy and his wife Mary Phelan. Patrick and Mary and their family moved to New Brunswick around 1837 from County Tipperary, Ireland. I have placed particular emphasis on the descendants of their son Laurence Morrissey, my great great grandfather, who moved to Montreal from New Brunswick in the early 1840s. The generations this history deals with are Patrick Morrissy and Mary Phelan who emigrated to New Brunswick; their son Laurence Morrissey and his wife Johannah Meany who moved from New Brunswick to Montreal; Laurence and Johannah's son Thomas Morrissey who married Mary Callaghan; Thomas and Mary's son John Martin Morrissey who married Edith Sweeney; Martin and Edith's son Edgar Morrissey who married Hilda Parker; and then a brief discussion of their two sons, my brother John and I, and our children. I have included as many names and details as are possible in a short history such as this. There is some question as to where the family originated in Ireland. While the exact location is unknown, research suggests it is could be one of three towns situated in the southern part of County Tipperary. 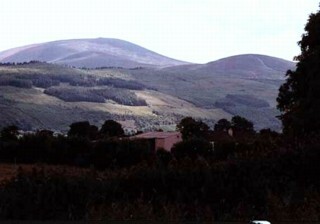 These are Clonmel, Carrick-on-Suir, and Mullinahone. All three towns are within a few kilometres of each other. Mullinahone is specifically mentioned in Hamilton's Dictionary of Miramichi Biography in its entry for John Veraker Morrissy, one of Patrick and Mary's grandchildren, otherwise Clonmel and Carrick-on-Suir are also suggested by several family members. The Morrissey surname has several derivations. Morrissey is an Anglicized version of the Irish "O'Muirgheasa", which means "sea taboo" or "sea choice", and is mainly found in the Sligo area of Ireland. Another derivation for the Morrissey name is from Maurus, Maurice, Morris, Moorish (suggesting a Moor), and identifies someone with a dark complexion. The Morrisseys I am dealing with are from the southeast part of Ireland, from County Tipperary, and are apparently descended from the Anglo-Normans who invaded Ireland in 1169 A.D. The Normans were originally Vikings who were given Normandy in France the 900s A.D. as a way to pacify them; however, the Norman descendants of the Vikings continued to conquer other lands. By 1066 the Normans successfully invaded Great Britain and then moved on to conquer Ireland a hundred years later. Red hair, which is found proportionately higher among the population of southeast Ireland, is common among members of the family. For instance, my son has inherited his red hair and fair complexion from my father. Red hair is caused by a recessive gene, and while three to five percent of the population originating in Western Europe have red hair, this percentage rises to 15% in those regions or Ireland, like Wexford or Waterford, that were either invaded by the Vikings or were on their trade routes. The first Norman landing in Ireland took place on 1 May 1169, and this is the earliest date that our ancestors could have been in Ireland. The towns that were captured by the Normans at that time are all fairly close to the area of Ireland from which we can trace our ancestry, Waterford, Tipperary, and so on. 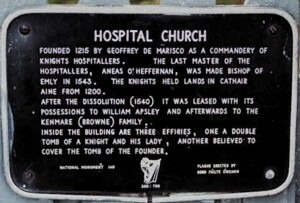 Plaque on the gateway to the abbey. Photo used by permission of Christopher Ryan. An explanation is needed regarding the spelling of the name "Morrissy". Some time after arriving in Montreal, Patrick and Mary's son Laurence adopted the more common spelling, which includes an "e". The family still residing in New Brunswick, and other family members in Minnesota, do not spell the name with an "e"; however, all of the Morrisseys in Montreal spell their name with the final letter 'e'. This is a small thing but needs to be stated, as I have not misspelled the name "Morrissey" in this short history on the Morrisseys! The present-day church at Hospital, Co. 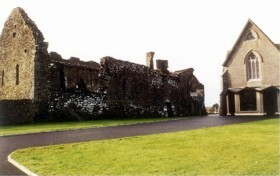 Limerick, built in 1852, ruins of the older church beside. Photograph used by permission of Christopher Ryan. Anecdotes, the story of achievements, happy events and sorrowful ones, addresses of where family members lived, the location of their graves, all of this brings life to a family history. In this short history I have included additional information on only some members of the family that I thought might be of special interest to the reader. I regret I haven't been able to include information about more family members; unfortunately space precludes this. A longer family history would allow me to celebrate in some way a greater number of family members; indeed, there is something of interest evening the most humble individual. This work is a gift of love to our ancestors who gave us their gift of love and life. Beginning with Laurence Morrissey, unless otherwise stated, family members discussed in this family history resided in Montreal, Quebec. In addition, most family members living in Montreal are buried at Notre Dame des Neiges Cemetery or Mount Royal Cemetery. Please see the list of burial places just before the Appendices. My thanks to Sandra Devlin who published my letter requesting information on the Morrisseys in her newspaper column published in several newspapers in the Maritimes. Family information was provided to me by William Morrissy, and Bannon Morrissy, both of Miramichi, New Brunswick; a special thanks to Jane Morrissy Allan, of Miramichi, who has become a friend and with whom I have had many informative phone calls; Hugh Morrissy of St. Paul, Minnesota; Sue McWilliam Stevenson of Ottawa; Gail Atkinson; my brother John Morrissey, and my mother Hilda Nichols. A special thanks to my cousin Sharon Callaghan who has generously shared with me family history research; Sharon is the undisputed authority on the three Callaghan priests that are discussed in this history, and it is from Sharon that I have obtained most of my information on them. I thank my wife Carolyn Zonailo for editing and discussing this project with me. The errors in this history are mine and I invite corrections where they are needed.